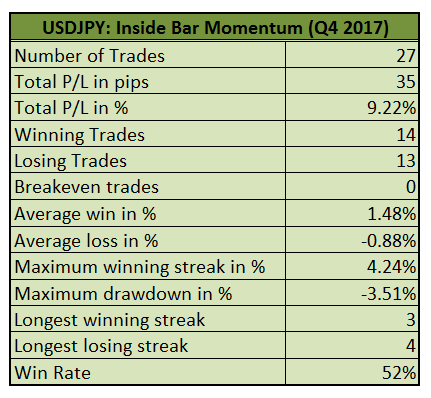 Before things get crazy over the holidays, I’m wrapping up the year a bit early with this forex strategy performance review for Q4 2017, minus the last couple of weeks of the year. 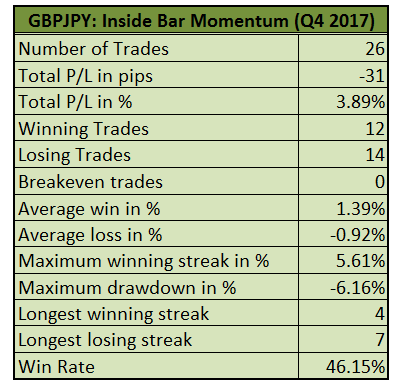 If this is the first time you’re reading about the Inside Bar Momentum Strategy, I suggest you take a look at the system rules first. ICYMI, I also applied stop loss adjustments to this quarter’s trades. I’m using 40% of the first candlestick’s length as basis for the stops compared to the original 20%. And I know I haven’t really covered the position sizing rules for this system just yet but, for simplicity’s sake, I decided to assume 1% risk per trade in order to help me analyze performance. This pair had roughly the same number of positions as in Q3 2017 and more than half also turned positive with a 52% win rate. The average win rate of 1.48% in Q4 is higher than the earlier 1.14% read and the 1.25% average gain in Q2. To top it off, the average loss is even smaller at 0.88% as plenty of the losing positions didn’t hit their full stops. Looking at the breakdown of trades per week shows that the pair had a bumpy ride in early November as it logged its longest losing streak of four positions then. It was instantly followed by the pair’s longest winning streak of three consecutive positions hitting their targets by the middle of the month! To say that Guppy had a rough start in Q4 is the understatement of the year as the pair kept getting stopped of its positions for seven (SEVEN!) consecutive instances in early October. This left the pair with a large max drawdown of 6.16% for the period and a 31-pip loss overall. Fortunately, it was also able to make up for this with a couple of four-trade winning streaks and an average win of 1.39% greater than the average loss of 0.92%. Because of that, I briefly considered taking this pair off the strategy, especially when it fell back in a funk in mid-November. The win rate ain’t so impressive also, down from the previous quarter’s 65.62% read to just 46.15% in Q3. Its overall profit in % is far behind, down from 14.56% in Q3 to just 3.89% for Q4. Still, it’s worth noting is that USD/JPY is up by 25.88% while GBP/JPY is up 37.60% for 2017 as the latter actually had a rockin’ good start and a stellar Q3. This should be an excellent conversation starter when I go to holiday parties in my buddies’ planets this year!